The first authorized vernacular Bible was printed in early 1539 and due to its tremendous heft the book became known as the Great Bible. To this day it stands as a milestone of the English Reformation. Aside from the enormous impact of a book containing the scriptures translated into English, the frontispiece that confronted readers upon opening the tome also sent a mighty message – and, indeed, this was an image seen by many. Because, regardless of its material grandeur, it is to be remembered that these Bibles, filled with two columns of Gothic print, often interspersed with a simple woodcut rendering of the accompanying passage, were functional books, printed at the behest of the Tudor regime. They were to be sent to parishes across the nation for the perusal of the parishioners after an order set forth by Thomas, Lord Cromwell, that required a copy to be placed ‘in some convenient place’ in every church in the realm. In order to furnish England’s parish churches, more than 9,000 copies of the Great Bible were printed between 1538 and 1541, presenting an unmissable propaganda opportunity for Henry VIII’s regime. Ever since the king had divorced England from the See of Rome in 1534 and fashioned himself as Supreme Head of the English Church, the Tudor state had embarked upon a multi-faceted propaganda exercise aimed at transmitting the new order of things to the English populace. This ranged from printed proclamations, pamphlets, and treatises to bien-pensant sermons and homilies. The Great Bible’s frontispiece continued this process, offering the viewer a visual summation of the Royal Supremacy as it was to be understood by English men and women – literate and non-literate alike. The intended symbolism inherent in the image is multi-layered; on first glance it is sledgehammer-subtle: a magnificent king surrounded by adoring subjects. Yet behind this lies a more muted series of insinuations and exhortations designed to filter into the Tudor parish consciousness via the king’s Great Bible. The whole frontispiece is well-proportioned and rich in detail. In the top right hand corner, somewhat obscured in the background, a bare-headed figure swathed in royal robes kneels before Christ, who peers through the clouds above. This individual, both modest and magnificent in the face of the lord, is King Henry assuming the guise of Moses and receiving the divine wisdom to spread the Word of God (Verbum Dei) to his people. This one fragment neatly encapsulates the message at the core of the image and the Royal Supremacy: Henry, the king of England, knelt directly before God. That the scriptures might act as a vehicle for such an authoritarian message may seem incongruous, but it was at the heart of the Henry’s Reformation. The king, like many in England, was a moderate, someone for whom many facets of continental reform (such as the Lutheran concept of sola scriptura) were profoundly troublesome. For him a vernacular Bible was a tool of re-edification rather than simple evangelising: it was a squint through which the theological justification of the Royal Supremacy could be glimpsed by all. In truth the king had little involvement with the project aside from allowing it to proceed, indeed Henry was at times profoundly wary of allowing common access to the scriptures, but for propaganda purposes this was beside the point. With this in mind the frontispiece is divided into four compartments. At the top Christ looks down upon the enthroned King Henry in the compartment beneath, a figure that dominates the whole image. The king holds two copies of the scriptures; one to be passed to Archbishop Cranmer who stands on his right, one for Lord Cromwell and the lay peers who stand on the king’s left. It is worth noting that just as Henry is bare-headed before God, so Cranmer and Cromwell appear hatless before their king. In the next compartment Cranmer and Cromwell distribute the Word of Godto kneeling clergy and laymen, while in the bottom section a preacher sets forth the word of God to massed crowds, who in turn cry ‘Vivat Rex’ and ‘God save the kynge’. The motif of Verbum Dei is particularly noteworthy, as it hints at a cornerstone of the Royal Supremacy, that is, that the king was the principal conduit of God’s Words. Overall, the message is clear. Thanks to Henry’s generosity the Word of God has percolated through the social order. Overall the image presents a rosy image of Tudor society: well ordered, strictly hierarchical, and content without the pope. Yet the image also carries warnings. Squirreled away in the bottom right-hand corner of the frontispiece is a small gaol, containing two inmates. The intended meaning of this is unclear as it seems to go against the otherwise serene picture of post-Supremacy society. Some have suggested that the placement of the prisoners amongst the otherwise adoring common-folk was to convey the redemptive potential offered by the vernacular scriptures, but I would suggest something more sinister. Firstly, it should be noted that none of the cries of ‘Vivat Rex’ rising from the crowd emanate from those in the gaol, suggesting that perhaps their love for the monarch was not as forthright. The gaol seems to represent those elements within the nation who grumbled against the king’s reforms, those who Henry was most desirous to reach with devices like this frontispiece. In 1536 a series of large rebellions in the north of England (the Pilgrimage of Grace) re-galvanised royal commitment to an English Bible. Access to vernacular scriptures was not a demand of the rebels, rather they were driven by an attachment to traditional religion; instead the vast scale of their rising (upwards of 40,000 ‘pilgrims’) demonstrated to King Henry that lingering religious ignorance amongst the people could be readily turned into rampant rebellion. Thus the vernacular Bible became a tool through which this ignorance could be remedied. In the frontispiece, then, the souls languishing in gaol were purposefully kept separate from the happy throngs outside as a subtle aide-mémoire to those sections of English society who obstinately repudiated Henry’s Reformation. The images are bolstered by the text that appears throughout the frontispiece. Various scrolls contain scriptural excerpts, which are ironically almost exclusively in Latin, selected to underpin the visual schema. Most of the textual allusions do not court subtlety. For example, at the top of the page Christ proclaims that in King Henry he has found ‘a man after my heart who will do all my will’ (Acts 13:22), while the kneeling Henry meekly retorts: ‘Thy word is a lantern unto my feet’ (Psalm 119:105). Notably underscored are the textual allusions to Moses. Sitting on his throne the king, invoking Moses’ sermons to the Israelites, instructs Lord Cromwell to ‘judge righteously’ (Deut. 16:18) and ‘hear the small as well as the great’ (Deut. 1:17). This follows the iconography of Henry sitting holding in his hands the Word of God which calls to mind Moses’ descent from Mount Sinai carrying the Commandments. Drawing parallels between Henry and the Old Testament prophet was a common tool of the Tudor propagandists, as, however, were allusions to biblical paramours like Kings Solomon and David. The suggestion that by purging England of Rome’s influence Henry had led his people out of a papal-Egypt was both flattering and potentially powerful during turbulent times. 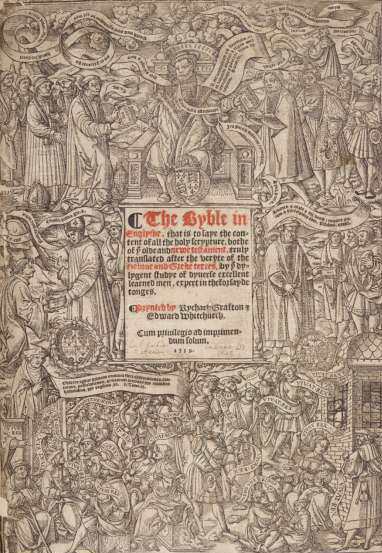 Aside from its obvious place in the history of English Bible translation and Anglicanism more generally, the Great Bible and its frontispiece provide modern viewers with a glimpse of the interplay between high politics and parish religion that characterises so much of the Henrician Reformation. Both the images and the biblical passages chosen to accompany the commanding opening image reinforce the divine providence that lay behind Henry’s authorisation of the Great Bible, his ordained role as Supreme Head of the Church, and, most of all, the obedience that his subjects owed to him as a result of this. It is an intricate and beguiling image, and we are lucky that it survives in such pristine condition in Rochester Cathedral’s Library.